229 people were injured, said Brazil’s Ministry of health citing figures provided by local hospitals, the Globo TV channel reported. The injured were taken to four major hospitals and there is an emergency unit providing support at the scene. Of 129 people who were hospitalized, 47 have already been discharged and 60 should leave shortly, the Globo network reported. The others are undergoing tests to determine what procedures should be conducted. 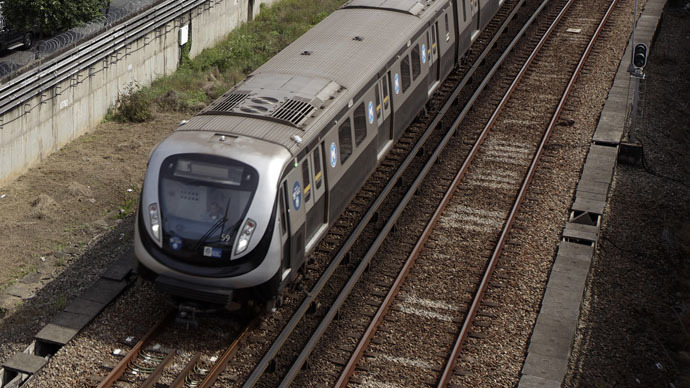 The accident happened in Mesquita around 8:20 pm (22:20 GMT), near Rio de Janeiro, and trains were suspended in the area following the incident. The army was summoned to assist rescue operations. “My head and back are injured. I’m in great pain,” 53-year-old passenger Ana Claudia Pereira da Silva de Oliveira told oGlobo, adding that there was panic, and screaming when the train lights went out. “A lot of people lost bags and mobile phones,” she added. “There were people with cuts and bleeding mouths. It was a war scene. There was a lot of smoke, and people thought the train was going to explode,” Thiago Portela, 28, said. Operations on the line have been halted, but authorities hope to resume later in the day. The collision could have been more serious, but the trains were moving slowly due to bad weather conditions in the region. Osório said the driver of the crashed train was not injured and is expected to be a major witness.